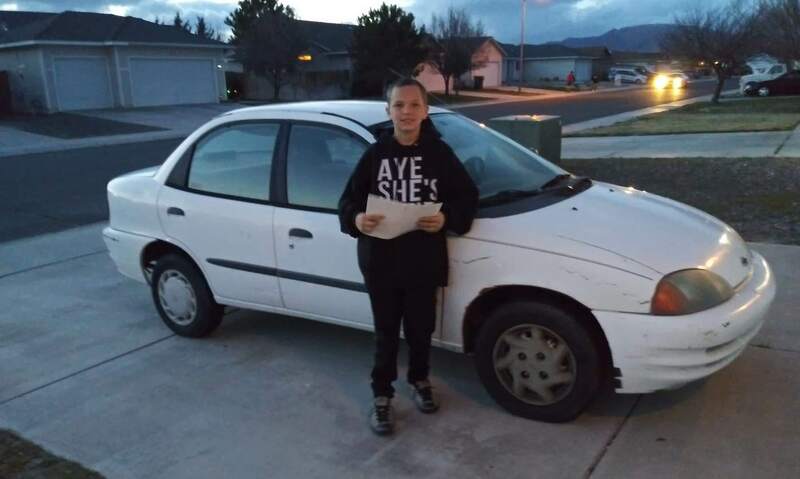 Not many 13-year-old boys can say that they were able to buy a car, let alone a car for their mother – but that is exactly what William Preston did last week. William’s mom, Krystal Preston, has been struggling to make ends meet since their family was forced to start over after an “unfortunate situation”. Since the single mother has been trying to provide for her three kids at their home in Fernley, Nevada, she has had no means of transportation – up until now. William was first inspired to give his mom a car after he spent some time watching videos of people giving cars to their mothers on Youtube. He later saw his chance to make his dream a reality when he saw that a woman on Facebook was trying to sell her 1999 Toyota Metro for a cheap price. The teenager reached out to the woman and asked if she was willing to trade him the car for his Xbox, along with some money that he had earned from doing yard work and house cleaning for people in his community. At first, the woman was hesitant, but after some negotiating, she eventually accepted his offer and drove the car over to William’s house. When William told his mom that he had gotten a car for her, she did not believe him. He then led her out to the driveway where the Toyota was waiting for her – and she could not contain her emotions.